Q? I volunteered to plan my ship’s reunion next year (we’re Navy veterans), and the one thing that worries me is the potential liability if someone gets hurt after having had “one too many” in our hospitality suite. What can I do to make sure that everything works out all right? A! 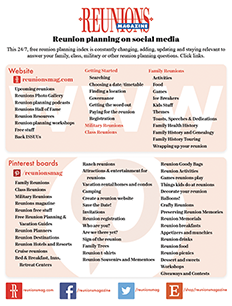 Serving alcoholic beverages at reunions is always a tricky question, regardless of whether it’s a military reunion, a family reunion, or a high school reunion. For many groups, this is their greatest area of potential liability and risk. By contrast, if your group fails to meet its obligation to the hotel to use a certain number of guest rooms, the problem can easily be resolved by writing the hotel a check for the unused rooms. But if someone is involved in an auto accident driving home from your reunion, there very well could be severe criminal and civil penalties involved, for both your group and all of your officers. You’re absolutely right to be concerned! Let’s start with the basics. There are a number of things you as a planner can do to help prevent someone from drinking “too much” to begin with. For example, many groups choose not to serve any “hard liquor” but only beer and wine. Whenever alcohol is served, you’ll want to have food available. Drinking on an empty stomach will cause people to become intoxicated more quickly. As planner, you can limit the length of time the bar is open. People tend to drink less if you have a “cash bar” rather than an “open bar” where the drinks are unlimited. If they have to pay out-of-pocket for each drink, they will slow down. Your bartenders and servers should all have had alcoholic beverage service training and be able to “cut off” anyone who has had too much to drink. Check with the hotel, restaurant, or venue to confirm this. In an attempt to save money, some groups arrange to purchase their own alcohol at a retail store and serve it in their hospitality suite. I would strongly discourage any group from trying to do this. Purchasing alcoholic beverages from the hotel covers you under the hotel’s liability insurance. Purchasing drinks on your own does not. The potential savings in the cost of a couple cases of beer is completely insignificant compared to the hundreds of thousands of dollars in potential legal liability you and your group could face in the event of a serious accident. My recommended alternative is to negotiate mutually-agreeable pricing for your drinks. Just like the price of your rooms and your catered meals, drink prices can be negotiated. Regardless of where your group is meeting, you’ll want to become familiar with state and local liquor laws. These laws vary greatly from state to state and city to city. Your hotel’s catering manager and your Convention and Visitors Bureau representative are both excellent sources of information about this subject. Likewise, the liquor laws for most states can be researched online. You don’t want to break the law, even unintentionally! For example, putting out a “donation” jar at a reception or in a hospitality suite, and asking your attendees to contribute money to cover the cost of their drinks has been ruled to constitute selling liquor without a license, and is illegal in virtually every state. two- or three-day reunion, and the cost of the policy to the group can be divided by the number of attendees and built into everyone’s registration fee. Check with a local insurance agent or on the Internet for “event insurance” for details, items covered, and potential costs. Next Article You’ve gotta eat!